Election Commission in India had always tried to provide the good services to the citizens of India. Like- Applying Voter ID Card online, Online check your name in Voter list and many more services. To more utilisation of these services by the citizens of India they had added one more service that can be utilised by many more people in the India. 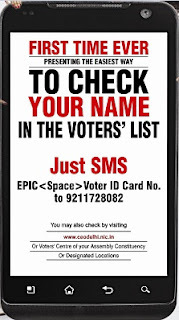 This new service is for checking the name in voter list by a simple SMS. As per my own opinion, This service is better than the online service. Because still many people did not have the internet connections, SO they are not able to check their name in the Voter List. Currently, This service is available for the people residing in Delhi area. I hope in coming days election commission of India will roll out the SMS service for checking your name in Voter List in all over India. 1. Type the below text in the message box. Immediately, You will get a SMS from Election Commission indicating your Name,Consituency, Part No. and Serial Number. If your name does not exists then you will get the SMS indicating "No Record Found". how to find the part no. and serial no. if the person is from bihar.